Camden Holtz beleives in victory through intimidation and superior firepower. particle cannons, plasma coupled multiguns and a laser turret might be enough firepower for most warcraft, Camden ups the ante with his ships unique dual JARS system. Such devices are currently blacklisted from most militias, and Camden is less than forthcoming about his units origins. The Wraith has several propulsion systems including photonic and gravitic, suplemnented by an array of articulated manuvering thrusters and is quite agile for a ship of it's size and physical sheilding load. 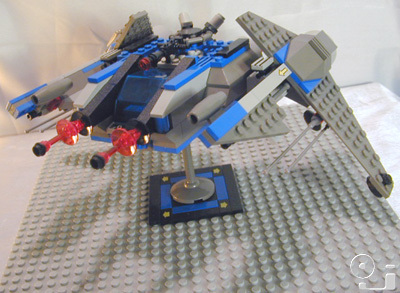 It is also a capable atmospheric fighter, though thankfully the JARS won't work in most atmospheres. Excellent pilot. Understands black market activity and trading - useful for aquiring non-aquirable goods. Skilled card player. willing to take any interesting risk. "Don't even ask where he got those JARS or you'll likely wind up on the receiving end of them!" "Sneaky and downright viscious - I wish he flew for us!" "Any sentitent with half a brain should understand that this man and his ship must not be allowed to continue perpetrating crimes agains reality!"